Today is the eve of Ramadan, the Muslim month long of fasting, intensive prayer, spiritual cleansing and above all, time for mending differences between people and their neighbours and communities. We at Gambia Voices would like to seize this opportunity to call on you, President Yahya Jammeh to release all political prisoners and abductees that are in your custody at present. Yusupha Lowe is an innocent boy who deserved to be in a classroom than in detention. Suppose the allegations against Yusupha’s father, Bai Lowe are true, the most appropriate thing to do is seek for his arrest and extradition to face trial in The Gambia, however, arresting an innocent child for alleged crimes of his father is the worst of crimes that anyone can commit. Meanwhile, Yahya, detaining Alhagie Mamut Ceesay And Ebou Jobe incommunicado for this long without charge or trial will only serve to alienate you and your regime further but will not help you in any shape or form. These people are from a family just like everyone else and they have a family just like you, so by detaining them without their families knowing their whereabouts, is everyday torture to not only the detainees but to their families, friends and love ones alike. You might have a better way to suppress your conscience than many of us, but you do have a conscience, why can’t you use your conscience to guide your behaviours and actions. Many times you defended most of your actions based on Islamic principles or teachings such as your execution of 9 prisoners nearly two years ago, your asylum to the ethnic Muslim Rohingya from Myanmar etc, why not take advantage of the same Islamic teachings or principles and free Alhagie Mamut Ceesay, Ebou Jobe and Yusupha Lowe. Furthermore, Amadou Sanneh the former accountant general of the Gambia and UDP treasurer has been sentenced to 5 years in prison with hard labour for only communicating with an external news outlet. 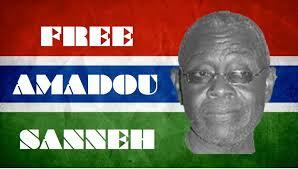 Mr Yahya Jammeh again we challenge you to judiciously use this forthcoming blessed month of Ramadan and your conscience to free Amadou Sanneh. Just like Alhagie Mamut Ceesay, Ebou Jobe and Yusupha Lowe, Amadou Sanneh has a family that need him most and by locking him in prison just because you have temporal powers to do so is contrary to the Islam you always used to base your actions on. Meanwhile, we would also call on your wife Zinab Suma Jammeh, to seize this moment and speak to you to release these people now. It has been said a wise woman knows the importance of speaking life into her man, if you love him, believe in him, encourage him to release Alhagie Mamut Ceesay, Ebou Jobe, Yusupha Lowe and Amadou Sanneh now so that everyone including you can be at PEACE. Ramadan Mubarak from Gambia Voices to every Muslim in the world.